Hypothecation, or the earmarking of taxes, has enjoyed a vogue in public policy debate since the 1980s, despite the absence of any evidence that it works in practice. Some of this is just rhetoric, e.g. the LibDems' proposal for an extra penny in income tax to be spent on education, while the recent morphing of green levies into "green crap" suggests that any tax is quickly reduced to an undifferentiated burden. Peter Wilby is the latest to suggest hypothecation as a "bold solution" for the ills of the health service - "bold" meaning less contentious than raising income tax. He characterises the environment thus: "The NHS is a monster. Its capacity to consume public resources is without limit. ... Failure to supply expensive drugs that give, at best, an extra few months of life to the terminally ill are denounced by newspapers that otherwise rail against high taxes". There is no paradox here. If your aim is to dismantle the NHS, then it makes sense to adopt a strategy that seeks to simultaneously undermine the system's twin strengths: economies of scale (which keep unit costs down) and rationing (which limits total cost). Claims that costs are out of control, that we are doomed because of demography, and that there is a bad culture are all attacks on the singularity of the NHS. Stories about postcode lotteries, the efficacy of alternative treatments, and rampant health tourism are all attacks on rationing. Like many others still nostalgic for triangulation, Wilby thinks that there may be a third way between the unacceptable policies of old (the now pejorative "tax and spend") and meek surrender to dismantling: "An earmarked health tax may be one whose time has come, and perhaps a model for financing other strained public services and modifying voters' resistance to taxation". The closest thing we have to a hypothecated tax is the BBC licence fee, which suggests that this is practical only for consumption goods rather than public goods (though pacifists regularly make the case for diverting their tax from defence spending). In reality, most consumption taxes bear no relation to costs. For example, in the 1920s and 30s vehicle excise duty (aka road tax) raised more than was necessary to fund road building, with the consequence that the Road Fund was raided for other purposes. Today, vehicle and fuel duties together are insufficient to pay for the total cost of road transport once externalities such as pollution are included. This swing reflected the historical shift from an elite pursuit to mass car-ownership, which both hugely increased the cost of the road network and created political pressure to lower the costs of entry. The standard case for hypothecation is a mixture of transparency ("a clear link" to counter voters' "disconnection"), popular choice (the figment of "accountability"), the dissolution of central power (i.e. Whitehall won't like it), and business-friendly anodynes about customer focus and service delivery. In recent decades this has also been given a pro-social spin, e.g. the "green levy" on energy bills, which suggests that hypothecation can also play a role in providing psychological compensation for social guilt, like charitable giving. The ideological framework is neoliberal: hypothecation is a way of creating artificial markets for public services; the popular mandate is translated into a financial exchange; the compartmentalisation of specific services and associated revenue-raising powers prepares the ground for privatisation (in the sense of outsourcing control of public services to private providers). It is also why hypothecation tends to be popular among those who own assets: focusing tax on consumption and the utilisation of public services distracts attention from the obligations of accumulated capital. The case against hypothecation is that it is pro-cyclical when demand for public services is broadly counter-cyclical. The chief example of this is National Insurance. In a recession, when demand for social security payments increases, NI revenue declines. Conversely, during a recovery NI revenue increases at just the moment when demand for benefits falls. The link between tax and expenditure cannot be maintained without perverse effects. A more hypothecated fiscal system would also exacerbate the tendency of politicians to become full-time bid managers for vested interests. It would discourage change: redundant services would linger on due to incumbent power (both corruption and the monopoly of media space), while newer service needs would struggle to get attention. Existing services would be under pressure to fragment in order to seek or maintain popularity - e.g. the Army might demand parity with the Navy (and its expensive nuclear subs), while working tax credits might split from JSA. Full hypothecation, where each citizen allocates their own tax payments by service (aka "tax choice"), is unlikely to happen any time soon, even though this is attractive to advocates of Public Choice Theory and conservatives who think the vote should be limited to those who pay tax. Ironically, if tried, this might produce some unusual results as a consequence of contemporary myths. For example, people might inadvertently allocate increased expenditure on the unemployed as they hugely over-estimate the current cost. Outside of the libertarian fringe, hypothecation is advanced selectively, but in two different modes: either defensively, such as "ring-fencing" health or education, or as a means of imposing the cost of externalities, such as the "polluter pays" principle. This looks progressive, but in practice it is regressive as it seeks to limit responsibility. Once you start down this slippery slope, it is difficult to resist the inevitable demands for greater choice, i.e. personal opt-outs: I have no kids, so why should I pay for ring-fenced education? ; or for more punitive "compensation": the poor commit most crimes, so they should pay for more of the criminal justice system. The fundamental problem with hypothecation is the transactional assumption that underpins it. The reductio ad absurdum is that the rich would never pay any tax because they would never need to make use of public goods; which is just another way of saying that public goods would disappear to be replaced by private goods funded on a subscription basis. Contrary to popular belief, cultivated since 1945 through both the social democrat contributory principle and the conservative taxpayer rights principle, taxation is not a transaction for services rendered. It is actually a means of redistributing wealth through public goods. When the economic system is rigged, so that equality of opportunity and meritocracy are mere Platonic ideals, the only way of countermanding this bias is through the redistribution of wealth in kind. That is why tax systems in most democracies tend to be progressive: the idea is not that the rich can afford more, but that the poor deserve more. This is why conservative bleats about the large share of tax revenue provided by the top 5 or 1% misses the point. The more they provide, the more they are clearly able to provide. Peter Wilby falls into the trap of supposing that we need to make tax for the NHS more salient because the majority dislikes paying tax in general but values the health service in particular. The truth is that neoliberalism has allowed the rich to escape tax and thus reduce revenues for public goods. The solution is not hypothecation but increasing the taxation of the rich. This is not a hypothetical solution, let alone an impossible Platonic ideal. We did it before and we can do it again. The conservative counterattack against Thomas Piketty's Capital in the Twenty-First Century has predictably ranged from the ad hominem ("his work lacks integrity ... he is a careerist"), through the snippy ("a bizarre ideological screed [that] ... revives Marx"), to denials that capital accumulation is an issue ("it won't matter as much as whether and how quickly wages and living standards rise"). A better class of critique has come from those of a more libertarian bent, such as Tyler Cowen. His appearance in the uber-conservative Foreign Affairs magazine, and his choice of review title ("Capital Punishment: Why a Global Tax on Wealth Won't End Inequality"), shows that he knows his audience. Some of his misgivings are just nit-picking (summarised here), but he hones in on two important points: the persistence of capital across generations, and the spur to innovation provided by wealth. Cowen's critique is consistent with his earlier work, such as The Great Stagnation, which sees capital accumulation as the product of technology and entrepreneurship, rather than the more traditional factors of production such as land and labour: "Friedrich Hayek and the other thinkers who belonged to the so-called Austrian School, understood that it is almost impossible to predict which factors of production will provide the most robust returns, since future economic outcomes will depend on the dynamic and essentially unforeseeable opportunities created by future entrepreneurs". Cowen is not afraid to predict greater inequality, as he did in Average is Over, but he believes that this is the unavoidable result of the increasing redundancy of most labour and the growing returns to the highly skilled, the causes of which lie in technology and related globalisation. This makes him sceptical of the idea that capital once accumulated will stay accumulated. Old money will decline as new money comes to the fore: "Today, the Rockefeller, Carnegie, and Ford family fortunes are quite dispersed, and the benefactors of those estates hardly run the United States, or even rival Bill Gates or Warren Buffett in the financial rankings. Gates’ heirs will probably inherit billions, but in all likelihood, their fortunes will also be surpassed by those of future innovators and tycoons, most of whom will not come from millionaire families". In other words, the creative destruction of capitalism will produce churn among the elite. His frank acceptance of inequality depends on a belief in a degree of social mobility that has never existed in recorded history. The suggestions that fortunes made in the Gilded Age have now been "dispersed" is easily disproved, notably (and amusingly) by the coincidental news that the White House has been hosting the "next generation" of the young and rich, including various Rockefellers and Hiltons, to discuss "impact investing" (the perfect mix of high rates of return, tax breaks and social kudos). The valorisation of philanthropy (and conspicuous consumption) and the whittling-away of inheritance and wealth taxes since the 1970s are of a piece. Wealth management is always first and foremost about wealth preservation. New money does arise, and it can create new elite structures and values, but old money is tenacious and absorption is the rule. Cowen then tries a different tack by suggesting that the possession of a fortune may have some moral worth: "Piketty fears the stasis and sluggishness of the rentier, but what might appear to be static blocks of wealth have done a great deal to boost dynamic productivity ... Stocks of wealth stimulated invention by liberating creators from the immediate demands of the marketplace and allowing them to explore their fancies, enriching generations to come". It's not quite the dilletante defence, as wealth may be the sponsor of talent rather than the subsidy of amateurism, but it's not far off. Cowen is on record as an advocate of a guaranteed income, partly in homage to the similar ideas of Milton Friedman (who saw it as a way of shrinking government and inculcating self-reliance), and partly because of the logic of his thesis of technology-induced unemployment. What he does not do is join the dots and suggest that freeing the many from wage slavery would actually stimulate far greater innovation and dynamism than indulging the fortunes of the few. Corey Robin correctly sources this hesitancy to Hayek's "theory of the wealthy and the well-born as an avant-garde of taste, as makers of new horizons of value from which the rest of humanity took its bearings". Cowen is here rehearsing an argument that originates in the reaction to the French Revolution, which is a backhanded compliment to the historical resonance of Piketty's work. Ultimately, Cowen's critique boils down to a case against wealth taxes: "The simple fact is that large wealth taxes do not mesh well with the norms and practices required by a successful and prosperous capitalist democracy"; this despite Piketty proving that it is precisely what happened in the 1945-80 period. Cowen's practical arguments are a mixture of the fatalistic ("if capital is so mobile and dynamic that it can avoid diminishing returns, as Piketty claims, then it will probably also avoid being taxed"), the shibboleth of "crowding out" ("in the long run, taxes of that level would surely lower investments in human capital and the creation of new businesses"), and a visceral belief in the inability of the state to manage a confiscatory tax system without inefficiency and corruption. You can imagine the readers of Foreign Affairs nodding sagely. If Piketty's proposal for a global wealth tax is "utopian", not least because it depends on a politically unacceptable levelling-down, then a carefully controlled levelling-up would make more sense, particularly if you wish to defend accumulated capital. On the right, the idea of a "basic income" quickly morphs into a "minimum income to supplement the earnings of the poor up to a given level", with the added advantage that it shrinks the state by allowing the abolition of the bureaucracy of welfare. In other words, the same mechanism that could eradicate poverty can be used to entrench it. The groundwork for a form of guaranteed income has been laid for some years now, in the guise of working tax credits and the normalisation of in-work benefits and zero-hour contracts, not to mention the raising of the tax-free allowance. You can even see economically illiterate nonsense such as "jobs protection" and scares about "benefit tourism" as ideological preparation for a "citizens' rights" agenda (as a Roman citizen, I demand my bread and circuses). I suspect the centre-left will continue with the archaic notion of a jobs guarantee, but the right is likely to push for a guaranteed income sooner or later. Though they perhaps lack the wit to make it a selling point, UKIP have flirted with a non means-tested "basic cash benefit" for low earners and the unemployed. Don't be surprised if the Tories steal their clothes. I've spared the commentary on Arsenal recently because they have been, I think everyone would agree, all over the place. It has been hard to make much sense of what has gone on, though I think we're now emerging from the waking nightmare. In early March I was still whistling cheerfully, hoping that Anfield was an aberration and that we would ignore the script that insisted on a collapse. To make matters worse, Liverpool have failed to crumple since, which raises the prospect that Alan Hansen's last season on MOTD will see them clinch the title. The chief compensation will be the look on Alex Ferguson's face when someone mentions "perch". That and the knowledge that the odious Mourinho would have been denied. In one sense we are the victims of our own success, the table-topping early season form having raised expectations, perhaps unreasonably (I thought 76 points a realistic target and we're still on for that). Wenger might have gambled during the transfer window, bringing in some fresh blood as a contingency for injuries and lost form, but there were few players of the required calibre available, not least because it's a World Cup year. Without reinforcements, we were riding our luck. Sure enough, the overlapping losses of Ramsey, Walcott, Wilshere and Ozil drained the team of its earlier zip and panache. Wenger's recent claim that we must "return to basics" is more an admission of inescapable constraints than a deliberate strategy. The return of Ramsey and (possibly) Ozil should give us more attacking variety, though the key for the run-in may well be the stability of the defence. Vermaelen has looked an unconvincing stand-in both at centre-back and left-back, so you have to hope Koscielny and Gibbs stay and get fit respectively. We're not going to discover some free-scoring strikers down the back of the sofa, so maximising our points total will require clean-sheets and opportunistic goals from midfield. Podolski is rightly seen as a specialist in the latter, but his defensive play is poor and unlikely to get better. I suspect his sparing use reflects Gibbs's injury proneness. The progress to the FA Cup final has been encouraging. Though the dominant narrative on the day will be about Arsenal potentially slipping up ("another Birmingham"), such that a victory will be sniffed at by the neutral, this ignores the team's success in beating Spurs, Liverpool and Everton to get there. We have fought our way through, and the mental fortitude of the penalty shootout against Wigan was part of that. My one regret is that the game is being played at Wembley, which remains a horrible ground, far inferior to Cardiff for atmosphere and only marginally more convenient for travel. To add insult to injury, 40k of the 90k tickets for the match will go to members of the "football family" (i.e. liggers and touts), which means only a 60% chance of getting a ticket in the draw for season ticket holders. I went to the semi-final and frankly enjoyed little of it. This was due less to the dull play (Wigan were unadventurous and we were too slow) and more to the pissed-up, angry Arsenal fans, particularly the two knobheads in front of me who insisted on standing, despite us being almost at the top of the upper tier. The chief use they found for the seats was to kick them in anger when Wigan scored. I'm not averse to swearing in frustration at games myself, but the vitriol directed at our own players and manager was just insane. The pissed knobhead to the left of me, who smoked throughout and disputed the decisions of a linesman who was a quarter of a mile away, was almost reasonable in comparison. Naturally, these same eejits were the loudest in celebration when we scored. They're a minority, but there is no doubt that they represent a distinct strand among supporters: blokes in their late 30s and 40s whose youth and early adulthood coincided with the long run of success from 1987 to 2005, for whom the lean years have perhaps reflected disappointments and narrowing options off the pitch. I'm reminded of Alan Sillitoe's The Match, not least because supporting Notts County through thin and thin puts our silverware drought into perspective. I had thought that this would be a season in which the title would be clinched with a low points total of around 80, but Liverpool could still achieve a total of 89, the same as the last two champions. If we take maximum points, we'll finish on 79. This will probably still only be enough for fourth spot, but it would represent progress: the last three seasons we've finished on 68, 70, and 73 points. If we can additionally win the FA Cup, then you'd have to mark the season down as one of real progress and encouragement, though I have a feeling the angry brigade will only be satisfied if we additionally make successful summer bids for Diego Costa, Bastien Schweinsteiger and Gareth Bale. The two most interesting men on the political scene today are a Frenchman whose name sounds English, and an Englishman whose name sounds French: Thomas Piketty and Nigel Farage. In their different ways, both are connoisseurs of power. The high profile given to Piketty's Capital in the Twenty-First Century confirms the return of political economy to the centre stage. In part this can be ascribed to the reputational damage suffered in 2008 by orthodox economics and its focus on ethically-neutral utility maximisers; in part it is a response to the disillusion felt when neoliberal politicians admitted that they could interfere with markets after all, bailing-out banks and socialising twenty-odd years of looting as public debt; and in part it is the result of the long gestation of the counter-movement against marketisation - the idea that the economy should be freed of social regulation in order to maximise growth. The return to an ethically-founded view of economics is welcome because it entails a focus on power. The modern defence of capitalism rests on the premise that "wealth is most readily increased in systems where those who are more productive earn greater incomes". In other words, allowing the talented to prosper raises aggregate growth, which in turn benefits all. This is not so much the nonsense of 1980s "trickle down" as a reformulation of the postwar consensus that growth was the engine of greater equality: a rising tide lifting all boats. This ultimately utilitarian approach ignores the impact of power - i.e. the way that incumbency is abused to preserve privilege. The importance of Piketty's work is to show that, without redistributive policies and confiscatory taxation, returns to capital exceed returns to growth, which leads to ever-widening inequality and the concentration of power. You need to address the politics as well as the economics. 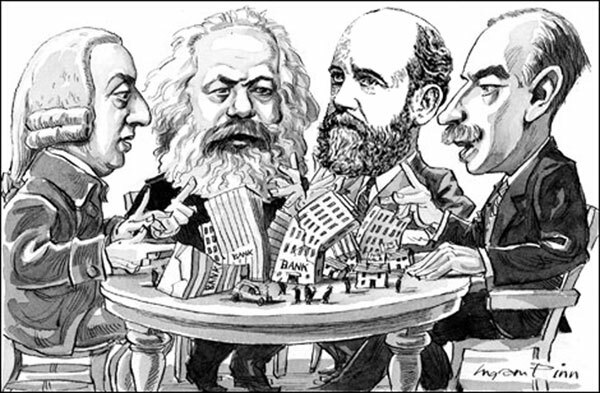 Despite the prominence of economic disputes in the 70s and 80s, such as the saltwater / freshwater debate and the monetarist experiment, the real watershed was a political shift in attitudes towards power that ultimately owed more to Hayek than Friedman and was heavily influenced by the anti-totalitarian focus on state agency over private inequality. The resulting neoliberal critique claimed to be the continuation of classical liberalism's concern with the balance of personal freedom and equality: a thread connecting Mill's view of liberty to Rawls's Difference Principle. The latter "permits diverging from strict equality so long as the inequalities in question would make the least advantaged in society materially better off than they would be under strict equality". The Rawlsian theory of justice is now under real pressure, not least because we see how "citizenship and democracy are ... sucked of their meaning by the super-rich". But this raises a question: why has mass democracy, which only arrived after World War One, allowed a return to the levels of inequality last seen in the Edwardian era? One explanation is that ideology maintains the linked fictions of equality of opportunity and merit, and that this provides cover for the continuation of patrimonial capitalism. Like TV talent shows, superstar executive pay and dotcom billionaires preserve the illusion that wealth is potentially available to all, no matter how humble our origins. Even if this success is the result of gaming the system, or just simple luck, it can still be seen as admirable if the former has the whiff of the iconoclastic upstart and the latter the appearance of a lottery. But the vast majority of people do not actually want spectacular success: their desires are for comfort and the absence of worry, not the furious competition of the free market. The driven individuals of entrepreneurial myth are very rare - if they weren't, the economy would be chaotic. Another explanation is that democracy "can be anti-egalitarian insofar as it causes politicians to heed the noisy but minor complaints of the privileged whilst ignoring the bigger but silent plight of the genuinely worst-off". In other words, democracy is a contest for attention and thus rewards the organised and vocal. But while there is obvious truth in this - it explains why a mansion tax is deemed less politically feasible than a spare bedroom tax - it doesn't explain why we largely ignore obvious abuses by the super-rich, such as tax dodging, nor why certain highly organised sectors of society are frustrated by their relative lack of influence. Opinion polls consistently show the electorate to be more pro-social and less pro-market than the political consensus. In other words, less tolerant of the compromises made with power. While some of this may be wishful thinking that evaporates in the voting booth, it's pretty obvious that no major party truly reflects this stance (Labour's terror of nationalisation is not shared by the public). This is not unreasonable - political parties tend to be aspirational, rather than a reflection of the status quo, because they attract people who want to change things, even if only to wind the clock back to a mythical past - but there clearly has to be continuity between the two. This suggests that the key problem with democracy may be one of representation; that the disillusion of recent years, from Iraq to expenses, is symptomatic of a widening gap between majority opinion and the policies on offer in the political "marketplace". In other words, this is another example of neoliberal regulatory capture that has not been rectified since 2008. In this light, UKIP's cheerful contempt for actual policies, and their reliance instead on vague sympathies, is very much of the moment, even if they did arrive at this position by the accident of incompetence. Much of their appeal concerns the issue of power, both real and imagined: controlling immigration, resisting "rule from Brussels", the over-weening state, the sins of the "political class" etc. In reality, UKIP are anti-redistribution and pro-inequality, which is why I think the claims that they will hoover up working class votes in the North are (outside the comic interlude of the EU elections) misplaced. Most of their party members are people who think they have an entitlement to power, while most of their supporters are people who feel increasingly powerless. Farage's besting of Nick Clegg in the recent EU debates has been described as the victory of stories over facts, which plays to a patronising belief among progressives that the unsophisticated electorate are suckers for hokey tales and simplistic images. In reality, Farage is simply channelling a wider contempt through dodgy anecdotes that would invite derision down the pub. A bonkers claim, such as that the EU writes 70% of our laws, works because it is bonkers. Farage's real trick is to show utter disrespect for the established parties and the norms of political debate. We actually want the allegations about maintaining a mistress on MEP expenses to be true; we want him to be a card. But the indulgence of Farage does not mean that we wish him any real power. As soon as he shows an appetite for it, we will deny him it. His popularity depends on being seen as anti-authority, not in promising a better authority. Tony Benn's five questions ("What power have you got? Where did you get it from? In whose interests do you exercise it? To whom are you accountable? And how can we get rid of you?") could serve as UKIP's manifesto, so long as they never get anywhere near real power and have the tables turned on them. The problem, as indicated by their desire to abolish inheritance tax, reduce corporation tax and implement a flat-rate income tax, is that the "interest" they represent is all too obviously the patrimonial wealth behind political power that Thomas Piketty has extensively profiled, and this becomes increasingly obvious the more they formalise their policies. In that sense, UKIP are utterly of their time, and will remain so regardless of the EU or immigration. The Guardian asks: "Can collective consumerism help cut energy bills?" Apparently, "Henry de Zoete, a 32-year-old former adviser to Conservative education secretary Michael Gove and scion of the De Zoete banking dynasty" has launched "The Big Deal on Energy", which seeks to use the power of group buying to secure improved tariffs for gas and electricity customers. I was amused to see this story appear on the same day that Alexei Miller, the CEO of Gazprom, announced that wholesale gas prices for Ukraine will be increased due to the lapsing of discounts negotiated by the former regime of Victor Yanukovych. These discounts were quid pro quos for Ukraine rejecting the association agreement with the EU, which led to the Maidan protests, and for the 2010 Kharkiv Accord, which extended Russia's lease on its Crimean naval base. The latter was recently rescinded by Vladimir Putin on the grounds that the annexation of Crimea made it irrelevant. The formality of the former lapsing indicates that we are probably now in the negotiated end-game of the Ukraine crisis. At one level, both of these initiatives are examples of exchange dynamics: the Russians are exploiting a monopoly position, while de Zoete & co are striving towards a monopsony (i.e. single buyer) ideal. In practice, we decry the former and applaud the latter. Ironically, Miller is arguably being more honest about the reality of the energy business. The criticism of Miller's announcement is directed at Gazprom's ultimate sponsor, Putin. EU sanctions against Gazprom are as unlikely as Chelsea running foul of UEFA's Financial Fair Play rules. Energy is a matter of national security, so no one is blathering about the wonders of the "free market" on this occasion, or suggesting that Gazprom is anything other than an arm of the Russian government. This is in contrast to the coincidental blathering in the UK about gas and electricity prices and the rapacious practices of the "big six" suppliers. The usual suspects on the right are busy claiming that any government intervention (whether in the form of price-caps or "green crap") is counter-productive, despite the obvious lesson from Gazprom that what we pay for our energy is driven as much by political design as scarcity or market dynamics. It is true that supply and demand determine prices over the long term, but it is also true that state intervention is the largest factor in sudden price fluctuations (and has been since the 1970s oil shocks), and that both wholesale and retail prices are heavily affected by domestic policy, even in the most pro-market economies. For example, the lower gas prices due to the "shale revolution" in the US are as much the product of government subsidies and a ban on exports as a breakthrough in technology or increased reserves. In the UK, the government has already (quietly) admitted that fracking will not lead to lower energy prices, any more than North Sea oil did, and that there are few parallels with the US experience. The wide variation in gas and electricity prices across Europe should be evidence that there is not a free market either at national or international level, and for a good reason. In a genuinely free market, exposed to wholesale price shocks and cut-throat competition, we would have both price volatility and the periodic failure of suppliers. This would mean that disconnections and blackouts would be regular occurrences (this actually happened in California in the early 00s). Given the risk of public disorder, not to mention the psychic damage of "third world" problems, developed nations tightly regulate their domestic energy supply, which means de facto cartels and the setting of price bands. The latter must reflect local affordability, which is why they tend to move inversely to the cost of other household staples, such as housing and food. The cost of energy is a public order issue, which is why Ed Miliband was taking few risks in promising to cap prices. The popularity of this rhetoric, and the irritation it caused in government and among the suppliers, shows that we all know the market doesn't exist and that the state can significantly influence prices without an investment strike. In this light, the proposal that our interests can be better served by "collective consumerism", i.e. switching en bloc, is crass. It sounds empowering, even a sentimental echo of the co-operative wholesale principle. In practice, it's the old idea of a buyers' club updated for the Internet age: essentially a mailing list where discounts are the quid pro quo for spam. "The Big Deal" may be focused on energy today, but a quick shufti at their terms (no mention of energy, just "campaigns and offers") indicates that this will become as promiscuous as Groupon. It is also worth remembering that while collective buying can be beneficial in aggregate (if it efficiently clears surplus stock), in a market such as energy, where prices are multifarious and openly manipulated, any savings achieved by the buyers' club will be cross-subsidised by higher tariffs charged to non-members, which will disproportionately affect poorer households obliged to use pre-payment meters or unable to commit to annual contracts. The Big Deal on Energy preserves the fiction that there is a buyers' market for gas and electricity and that government is ultimately powerless. According to Henry de Zoete: "people power can fix the energy market quicker than politicians." Alexei Miller could soon put him right on that one. What links gay marriage and full employment? Though we never lack for people who interpret variations in marriage practice as evidence of fluctuating morality, there has always been a firmer relationship between the institution and the hard facts of class and economy. Marriage in law remains largely a matter of property rights and inheritance, which is why it has always been more popular among the middle class than the working class. Gay marriage is already looking almost stereotypically "middle Britain" in its emphasis on common sense, good humour and mawkish sentimentality. When we marry depends largely on our economic circumstances. Where once heterosexual marriage was the precursor to childbearing, it now typically follows it. In other words, women often seek the "security" of marriage once their economic independence is diminished or made vulnerable. Likewise, working class women increasingly eschew marriage not because they want to live off the state but because working class men increasingly bring insufficient economic value to make formalising a relationship worthwhile. Tax-breaks for married couples are small beer in comparison. George Osborne's commitment to "fight for full employment" is opaque, but given the recent record on job creation and the absence of any credible plans to alter the composition of the economy (aka "rebalancing"), it will most likely be achieved, if it is achieved at all, through the expansion of low wage roles in the service sector. As the total workforce participation rate has barely changed over time, beyond women substituting for men (i.e. men have dropped out of the labour market altogether as women have entered it), it is also obvious that this will require some degree of workfare-style coercion. The Tories criticism of Labour's "jobs guarantee" is essentially semantic. Both are committed to the state direction of unskilled labour and the subsidising of low-wage employers. The consequence will be to depress median wages and productivity further. It will also expand the already large number on the statutory minimum wage, which since its introduction has inched towards becoming the norm rather than staying an outside boundary. It is noteworthy that Germany is now thinking of introducing a minimum wage, presumably because they have seen how "beneficial" it can be in acting as drag on median wage growth. In their defence, increased profitability due to wage restraint since the mid-00s has led to higher levels of investment and thus better productivity growth, though this in turn reflects a larger, export-oriented manufacturing sector. In contrast, wage restraint in the UK has not stimulated investment but led to labour-capital substitution - i.e. employing more cheap workers instead of better equipment. But low investment and poor productivity growth will not continue indefinitely. Despite the techno-pessimists, it is becoming increasingly obvious that we're in the middle of a radical economic transformation, the start of which can be dated to the post-dotcom bubble recovery in 2003. The coincidence of the "war on terror" should also be noted, as the hegemony of the information economy is as much a product of political will as commercial innovation. Martin Wolf contrasts this new turn with the industrial revolution: "The machines of the first age replaced and multiplied the physical labour of humans and animals. The machines of the second age will replace and multiply our intelligence". That ambiguous word covers both business insight and the "intel" of state surveillance. But this is not human intelligence, except in a narrow and reductive sense. It is a mistake to assume that "robots" replacing white-collar jobs is about technology carrying out cognitive tasks. Very few white collar jobs entail any real cognitive independence or improvisation. You are usually following a script of some sort, and the impact of process engineering and lean manufacturing, which maximise algorithmic control and minimise human agency, has been to proceduralise more and more jobs (the bureaucracy of targets in the public sector serves the same purpose). Of course, some are better at adapting to this than others. Thus in finance the tendency towards automation and complexity is partly driven by obfuscation, which provides excellent cover for abuse. The Economist attempts to put a positive spin on this: "leaps in machine intelligence could create space for people to specialise in more emotive occupations, as yet unsuited to machines: a world of artists and therapists, love counsellors and yoga instructors. Such emotional and relational work could be as critical to the future as metal-bashing was in the past, even if it gets little respect at first". To this list you can now add wedding planners, choristers and pre-nuptial agreement lawyers. The problem, as hinted at by George Osborne's new-found determination, is that these fulfilling roles will, like marriage, bias towards the better-off. The future equivalent of metal-bashers can expect bit parts as personal waiters and synchronised forelock-tuggers, not to mention the joys of cohabitation and permanent renting.